No position on the football team is as important as the quarterback. One only has to witness the struggles of the Oregon Ducks offense the past month and a half, and be a part of social media, or not live under a rock to know this. 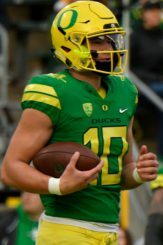 And there has been fan-base debate all over the spectrum as to why (or if for that matter) true freshman Braxton Burmeister will ever match the productivity “under center” of wunderkind Justin Herbert, the sophomore who grew up a stones throw from Autzen Stadium. It’s difficult to grasp just what Justin Herbert did as a true freshman without the benefit of context. And his performance as a starting quarterback in thirteen games has been nothing short of spectacular. What Oregon fans don’t seem to grasp is how unusual this is. The Great Blue North just posted their first positional rankings for the upcoming 2018 NFL Draft, and of particular interest is the top quarterbacks projected to go early. I selected five that are draft-eligible to study for comparison purposes versus Herbert to help gain perspective. At the top of the list are fellow Pac-12 signal callers Josh Rosen, and Sam Darnold. In addition Mason Rudolph, Jake Browning and Baker Mayfield are all guys I feel will find their way on to an NFL roster. The “Chosen One” listed by ESPN.com as a 4* and Rivals.com and Scout.com as a 5* recruit. As a true freshman he beat out incumbent junior Jerry Neuheisel and in thirteen games put up 3,669 yards, 23 touchdowns with 11 interceptions and a QB rating of 134.3. As a redshirt-freshman the former San Clemente High School-star amassed over 3,000 yards and 31 touchdowns while giving up 9 picks. A very respectable 3-to-1 TD to Interception ratio and a blistering QB rating of 161.1. Sam Darnold was a consensus 4* recruit coming out of high school and a very good athlete. In addition to football he also played baseball and excelled at basketball. Jake Browning from Folsom High School in the Sacramento area, is the National all-time passing touchdown record holder at 229 for his high school career. 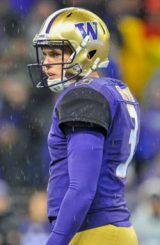 As the first true freshman to start for the Huskies in twenty years–Browning threw for nearly 3,000 yards and 16 touchdowns for a solid 139.3 QB rating. Browning was a 4* recruit by ESPN.com in addition to Rivals.com. 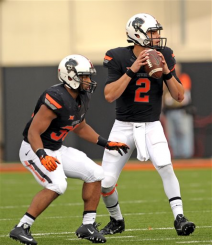 Mason Rudolph was a 4* rated pro-style quarterback who threw for nearly 11,000 yards and 132 touchdowns in high school. As a freshman at Oklahoma State he stepped into the starting role after injuries to the top two quarterbacks on the depth chart, and finished the season for the Cowboys. He put up respectable numbers (6 touchdowns and nearly 900 yards) and an impressive 154.0 QB rating in only 3 games. The old adage that there is an exception to every rule applies to quarterbacks too, and in particular Baker Mayfield. A consensus 3* rated kid from Austin, Texas he threw for nearly 7,000 yards and 67 touchdowns in high school. However he was a “walk-on” rather than a coveted recruiting gem at Texas Tech. He proceeded to light up the conference on his way to Big-12 Offensive Player of the Year for 2013. An ensuing transfer to Oklahoma found him in a walk-on situation again. 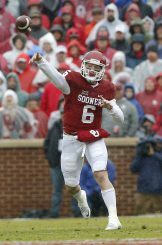 The consummate competitor that he is, Mayfield worked his way to the top of the depth chart after sitting out the 2014 season due to transfer rules. Since then the gunslinger from Austin has been sensational, throwing for nearly 11,000 yards and 104 touchdowns, and an impressive 188.94 QB rating. Rosen as a true freshman threw for 3,669 yards and 23 touchdowns for a QB rating of 134.3. 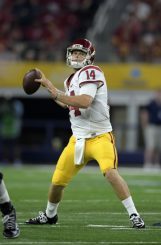 Darnold as a redshirt freshman threw for 3,086 yards and 31 touchdowns for a QB rating of 161.1. Browning as a true freshman and sophomore threw for 3,249 yards and 19 touchdowns for a QB rating of 140. As a true freshman and true sophomore, Rudolph threw for 4,014 yards and 24 touchdowns for a QB rating of 160. Mayfield over the course of three seasons threw for 3,908 yards and 26 touchdowns for a QB rating of 150.9. However approximately 59% of his yardage and 48% of his touchdown production was achieved as a walk-on freshman at Texas Tech in 2013. As a true freshman and a true sophomore, Herbert threw for 3,200 yards and 28 touchdowns for a QB rating of 156.7. So…What Does All of This Mean? The first thirteen starts of their college careers represents a statistical comparison of these highly regarded quarterbacks with Justin Herbert’s. 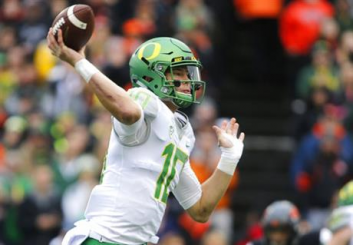 It is a statistical analysis to help put into perspective that what he has done in his short tenure as the Ducks starting quarterback is not only impressive, but is extremely rare. What is remarkable is that Herbert did this without the benefit of a redshirt year such as Sam Darnold or a spring practice due to an early enrollee situation. He came into fall camp as a true freshman and rose up the depth chart to emerge as the backup quarterback to 5th year senior transfer Dakota Prukop in less than 15 practices. As a result two incumbent highly-regarded scholarship quarterbacks subsequently left the program and it can only be assumed that it was due to what they witnessed in practice, and their future prospects for playing time. Is he Heisman Trophy Worthy? 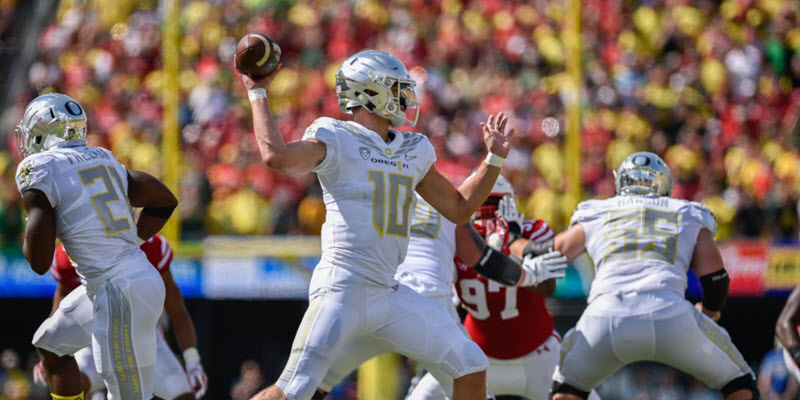 If Justin Herbert continues to develop on the same path that he has started his career with, he may very well find himself in New York at the end of next season. A big kid that can make all of the throws and has the gift of being able to process information quickly, he no doubt (barring injury) will have a big year in 2018 worthy of Heisman consideration. The job of playing quarterback at a high level is a daunting task. Aside from the physical requirements of Height, Weight, and Speed also known as “triangle numbers”; a candidate for this position must have the emotional and mental aptitude also. Emotionally they must maintain an even disposition, never getting too high or too low throughout the game because a teams fortunes change sometimes from play-to-play. In addition the ability to process information quickly and make the correct decisions cannot be overemphasized. A high IQ is a must to perform at this level. In a country of 323 million people there are only about fifty to seventy-five really good collegiate quarterbacks playing in any given year. That is an infinitesimal minute number. And because the NFL is a giant step up, that percentage is cut in half. And the number of NFL quarterbacks that play at an ELITE level? Barely the top half of all starting QB’s play at what can be considered an elite level. Justin Herbert is a natural. He possesses the natural athletic gifts; but aside from that he has the confidence, poise, charisma, and intelligence to play at a very high level. Given his age, his best football is ahead of him and without a doubt challenge Heisman Trophy-winning quarterback Marcus Mariota as the best ever to play the position at Oregon.